SKU: AFA03. Categories: Tools & Equipment, Automotive Tools. Tags: engine hoist, towable engine hoist. This tool works in conjunction with an engine hoist to level out your load by allowing you to adjust your loads center point. Works great for pulling or installing an engine with the transmission attached. 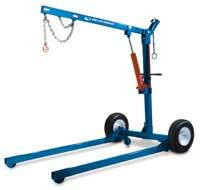 The engine hoist itself is rented separately. The rate on this item is per 24 hours.